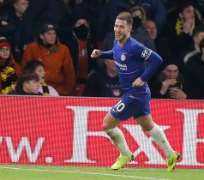 WATFORD, England — Chelsea talisman Eden Hazard became the 10th player to score 100 goals for the club when his double clinched a 2-1 win at Watford in the English Premier League on Wednesday. Brazil playmaker Willian hit the post from an acute angle after rounding goalkeeper Ben Foster before Hazard showed his teammate how it should be done in first-half stoppage time. Hazard was sent racing clear of the Watford defense and slotted the ball into an empty net after dribbling his way round Foster. Fourth-placed Chelsea was rocked by an equalizer on the stroke of halftime, though. The visitors cleared a corner to the edge of the penalty area and Roberto Pereyra drilled a fine volley low into the bottom corner of the net. David Luiz then escaped without punishment for a robust challenge in the area on Watford's former Barcelona winger Gerard Deulofeu. Referee Martin Atkinson looked more kindly on Hazard when he collided with Foster in the 58th minute and the Belgium forward picked himself up to score from the penalty spot. Hazard could also have had two assists late on, but Willian missed a good chance and N'Golo Kante drilled his shot wide after going through one-on-one with Foster.